A complete compressed air system assessment should provide detailed information on both the supply and demand sides of the system. The supply-side refers to the equipment supplying compressed air – the air compressor, dryers, filters, piping and storage tanks. The purpose of this article is to illustrate what information we believe a factory should receive from a supply-side system assessment and more importantly – what information a plant should always know about their compressed air system. To illustrate this, and due to article space constraints, we will provide examples of the information we believe end users should receive on their air compressor and air dryers. To provide examples, we will use commentary and tables we generated, quite some years ago, during a compressed air system assessment at a chemical plant in the Midwest. We recommend putting the averages of all the Key Performance Indicators together into one table – and tracking them. These include system flow (scfm), air compressor discharge pressure (psig), system pressure (psig), input electric power (kW), operating hours of the air system (hrs), specific power (scfm per kW), electric cost per year for compressed air in dollars per unit of flow ($ per cfm per year), and finally the annual electric cost for compressed air ($ per year). *Based upon on a blended electric rate of $0.06 per kWh and 8,600 hours/year. The system assessment should provide detailed information on the air compressor use profile. In this manner, one can assess if the air compressors are working with or against one another. One can also assess if the air compressors are working within their “sweet spots” – the load percentages where they operate efficiently and reliably. During how many shifts are the air compressors working? What is the rated full-load kW consumption and air flow (scfm) delivery capacity of each air compressor? Compare actual kW demand and air flow as a percentage of full load. In this case, we had two physical areas to analyze; the main plant and “building ZR3B2”. Example: The system is currently operating with both Centac units at 100% base load most of the time with the Kobelco running in trim mode. The “Case AirLogix” controller appears to be running well. The Centac 2-stage units have very limited effective turndown (20%+) and also are relatively inefficient compared to today’s more modern units. The pipe size and velocity of air in pipes is not causing problems with the ability to control units to allow the air supply system to match air flow of demand. The new 5” header and piping changes made, as described in Air Power USA’s 2002 report, are working well and both Centac units can fully “load in” with no restrictions. The Kobelco is a load/no load or on-line/off-line control, which is either full load or no load. It is currently difficult to set it up in the same system with the plant centrifugals because the load/no load controls need an operating control band to work. The Centac units use a set point and throttle range. This means that the load/no load machine will back down the Centac units unless the set point is below their operating range. A regulator was installed in the line coming from the Kobelco receiver to correct this situation. However, during the site visit, we noticed that as the Kobelco moved up its operating band (100-107 psig), the system pressure moved up similarly, including the discharge pressure at the Centac units. Thus, the centrifugals are still backing down some, even though the controllers are showing full flow. Centrifugal flow will always fall somewhat depending on the performance profile as it sees higher discharge pressure. These two 2-stage centrifugals are well maintained, but are significantly less power efficient and reliable than a modern 3-stage unit when well applied. The Kobelco appears to be operating very well and it is an excellent unit and also appears to be well maintained. As time goes by in most plants, compressed air systems can become a hodge-podge of different models and brands of air compressors, dryers, filters and receiver tanks. Rental air compressors can be included in the mix to assist with demand spikes. The piping systems can become a bewildering mix of sizes and materials (and leaks). We strongly suggest some kind of visualization tool from a simple block diagram to a nicer graphic representation of the supply-side of the system. Air compressors are durable and long-lasting machines which will outlast most employees when they are properly maintained. A good system assessment will work with maintenance and review the service records of the air compressors. In this case, the air compressors had all been operating for 15+ years. Below is an example of some of the observations made. We provide the client with an examination of voltage, amps, motor power factor and kW consumption of each air compressor – during each of the three productions shifts. Example: Today’s compressed air system consists of two Ingersoll-Rand Centac model C10M2, one Kobelco model KNW2, 200-hp class, lubricant-free rotary screw compressor, and, one Atlas Copco model ZR200 lubricant-free rotary screw compressor which is out of service and not part of the current operating air system. The Ingersoll-Rand Centac compressors had some problems in the past with motors and mother control boards in addition to other components. The West Ingersoll-Rand Centac has a 350-hp motor and the East Ingersoll-Rand Centac has a 400-hp motor. The motors were overhauled in 1994 and 1995 respectively. These units were rated for 1,037 cfm and new, equipped with throttled inlet with by-pass, and auto dual control, which will let the unit fully unload and idle. The current piping and effective storage will not allow the dual control to work. Both compressors are running base air load. Plant personnel believe that when the Centac units were overhauled in 1994/1995, wheels were replaced with 1,500-cfm rated wheels. The compressors are delivering approximately 1,320 scfm each and draw 270 average kW when running full load. The East Compressor was drawing 242 average kW. The units have 20-25 % turndown. Total air flows are measured with a Sierra heated-wire, thermal-mass flow meter. Data is real time and trended with one point every 10 seconds. Flows reflect data observed over several days and several times per shift. The units had the wheels and diffusers cleaned and reset but no modification in 2004 or 2010 according to Air Relief service records. The East unit in 2004 and the west in 2010 the blow off air was directed to the compressor inlet which depending on conditions can cause premature internal part deterioration. The units are still running with this piping. If the units are going to operated significantly in the future this should be checked with the OEM. During the August 2011 audit site visit, the following electrical data readings were taken. Both units were operating at 101-102 psig and had the IBV 100% open and the BOV 100% closed. Compressed air quality (in terms of moisture, oil and particulate removal) is critical to the reliability of production equipment. Compressed air dryers, filters, drains are always an important part of a system assessment. Are they functioning properly, are the technologies out-dated? In the case below, we recommended the dryer be replaced with a much more energy efficient Heat-of-Compression dryer. Example: The plant’s current dryer is a 4,000-scfm rated Pioneer blower purge dryer with 17-kW motor drive blower and 120-kW heater. The dryer is equipped with a dew point demand controller to shut off the blower air during the cooling cycle to avoid the pressure dew point spike and thermal bumps. At the time of our visit in 2002 and also 2011 (August) the dew point demand control was off and the pressure dew point was -40°F or better according to the central meter. This is somewhat suspect. Operating Data 16 August 2011- 8:30 AM – 10:30 AM. The dryer was running default heatless mode (300 scfm purge air) from Monday through 2:50 pm Wednesday, August 17, 2011. 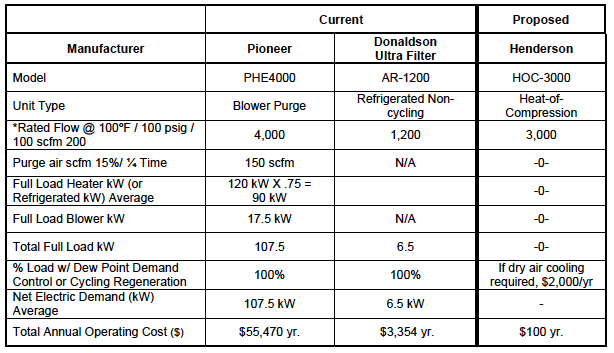 Currently the plant is running a Pioneer 4,000 scfm maximum rated, blower purge desiccant dryer with a 5-psig drop. This dryer is working well; however, this unit has dew point demand control which could save an estimated $20,000-22,000 per year if activated and working. The dew point demand controller is not activated. The exhaust muffler also needs to be replaced. The plant may also wish to consider replacing the standard filters with high performance, deep-bed, loose-packed filters to extend and reduce pressure drop. This is a relatively old dryer with obsolete valving (switching valves that leak and will continue to do so unless overhauled). At this time, the dryer is running continuously in heatless mode with the blower off and the heaters off probably using 300 scfm of compressed air according to plant personnel. The readjusted purge pressure was measured as performing on the plant data systems to –40°F or better. At 2:50 pm on August 17, 2011, the dryer was reset to normal operation and the purge also shut off. The Kobelco compressor went from 85% load (timed cycle – 471 scfm) to 40% load (timed cycle – 221 scfm). This situation would put the purge rate at a minimum of 250 scfm. Considering the dynamics of the air system, we agree the plant’s number of 300 scfm as the purge volume. We hope these tables and figures can provide end users with a feel for what information they should know about their current air compressors and dryers. Ideally they will own a compressed air management system able to provide them with this data in real-time. If not and they engage the services of a firm to conduct a supply-side compressed air system assessment, this is a part of the information they should receive – before beginning conversations about how to improve the system. To read more about Compressed Air System Assessments please visit www.airbestpractices.com/system-assessments.